A fellow Guyanese lawyer generously gave me an opportunity to accompany her while she left the capital city of Georgetown to work in Region 2, the Pomeroon-Supenaam area along the Essequibo coast. My day started before 6AM in the picturesque village of Eccles, which is on the outskirts of Georgetown in a neighbourhood that had the idyllic neighbourly feel of a North American subdivision. We then set off in her pickup truck on the long journey through Region 3 district of Essequibo Islands-West Demerara, on the bridge over the Demerara River with its clanking metal plates and through the many villages along the way. Eventually we arrived in the township of Parika. Even though my colleague described it as an outpost that was too small to be a town, it was impressively busy with dozens and dozens of vendor stalls along the roads selling pretty much anything you might need - fruit, DVDs, plaintain chips, clothes, hammocks, and cold drinks. It's known for its Sunday markets, but even on a Wednesday it was bustling, due to the fact that it is a port hub for both land and river transportation. We ourselves were there to take a water taxi through the Essequibo Islands. We were allowed to park at the Parika Police Station (I imagine because of my colleague's good relations with the police and not because the Parika police let city folks use their lot for free parking) and did a little bit of shopping at the market stalls. Sadly there was no honey available, which this area is well known for, because of production problems due to the weather, but it was nice to be greeted by a number of locals on the street who all seemed to know my colleague. It was a refreshing breath of fresh air to be away from hectic Georgetown in this friendly port, where robbery rates are much lower and nobody was catcalling me (but again, maybe it was thanks to my respected colleague accompanying me). slogan on the side of one of the water taxis - pretty good life motto! Eventually, we made our way to the water taxis and loaded into the boat. Usually you have to wait until the boat is full before they leave, and sometimes that can be a very long time if there aren't a lot of folks looking to cross the river, but luckily at this time of day (about 7:30AM, I think? ), there were many commuters taking the trip, so we were able to take off shortly. Some folks were with their kids, some businessmen had their briefcases, and I saw one man stepping off the dock with two crates filled with live chirping yellow chicks. It was a lovely boat ride through the Essequibo Islands. The local Guyanese refer to the water taxis as as speed boats, but my colleague explained that they aren't really speed boats in the sense of some of the monstrous roaring ego machines you see at cottages on the lakes of North America, but they are boats with motors and we were still zipping through the water at a fun pace. There are over three hundred islands on the Essequibo river, some uninhabited and some inhabited with even farms. This region reminded me somewhat of the Thousand Islands in the St Lawrence River in Ontario. There were so many huge islands everywhere! The scenery was absolutely breathtaking. Despite the fast clip of the boat, I felt myself relaxing into a peaceful tranquility. due to cold weather conditions like Arctic lawyers do, but transport in these parts of Guyana is not always easy. My colleague explained to me that once after court had ended, there were no more water taxis and she had to find her own way back. She waited and waited until a farmer offered to let her hitch a ride on his boat - as long as she was okay with sharing the ride with his herd of goats and sheep. What else could you do? So she got on the boat, wearing her suit and carrying her briefcase. Luckily, the sheep and goats were used to the boat ride and sat calmly through the boat ride. Although enjoyable, the boat ride took longer than I initially thought it would, because the Essequibo River is much wider than I thought it would be. Once we got off the docks, we stopped off at a snack stand, where I got an aloe juice (as an Asian, I'm thrilled to report they sell these everywhere!) and a delicious snack made from cassava, which is a root and is also apparently listed as one of the world's most dangerous foods because if you do it wrong it can produce cyanide. But it was soooo yummy. Maybe the danger makes it delicious. Then, as if our journey wasn't lengthy or adventurous enough, we were approached rather enthusiastically by a number of taxi drivers shouting various destinations. Again, these shared taxis generally do not leave until their cabs are filled with the maximum number of passengers so sometimes it involves waiting for quite a while. But eventually we found sufficient passengers to leave and made our way through the long winding roads through the villages, weaving past hitch hikers on the side of the road and donkeys crossing. Like a true Canadian, I took a bunch of photos of coconut trees. The communities had names that sounded like some European settlers were either trying to write poetry or crack jokes with names like The Jib, Fear Not, Devonshire Castle, Windsor Castle, Hampton Court. These were small communities too, often only one road long, with the entire Pomeroon-Supenaam region having a population of less than 50,000. We finally arrived in Charity, where my colleague had a court matter. It had taken several hours to arrive here. I was amazed that some lawyers make this long trek on a regular (sometimes weekly) basis. 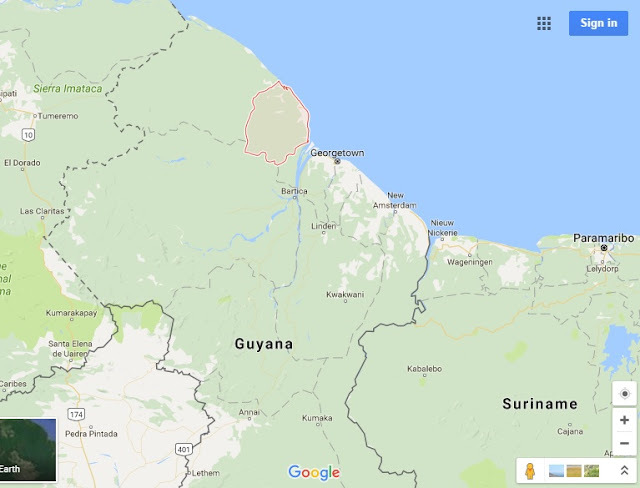 My colleague joked about how in Britain, there is the term ABC which stands for "Another Bloody Castle", but in Guyana, the term is ABR: Another Bloody River. There are so many of them! I could never get tired of them though. Charity is the last township where the paved road ends at the Pomeroon River. From there, if you wanted to, you could take a boat up the river until it meets the Atlantic Ocean and then cross over to Venezuela, one of the only ways to do it. Everyone in Charity seemed to know my colleague as well, and I had the privilege of attending a session at the magistrate's court, where I observed a landlord-tenant matter relating to rice assessment. Rice is a big industry here. After the court session ended, we hitched a ride to Anna Regina with one of the members of the court, so we all piled into the pickup truck and got off at the magistrates court in Anna Regina, where I got to observe the tail end of a drug prosecution matter. The courthouse has a bit of a problem with pigeons hanging out in the rafters, but I very much enjoyed my visit. Overall it has been a pleasure for me to interact with the judiciary and legal bar of Guyana who have overwhelmed me with their hospitality. We stopped at an orchid place where I saw orchids growing in the outdoors for the first time in my life, hugging an old mango tree. On the way back, the water taxi took a lot longer to fill, but eventually passengers straggled in. The return boat ride was a lot more bumpy and wet, but I still managed to nod off during the ride. It had been a long exciting excursion and now I was ready for a nap.